Gertrude “Trudy” Maryott was born May 10, 1935 to Joel W. and Emma (Parsons) Gatewood in rural Decatur, Nebraska. She passed away at the Life Care Center of Elkhorn, in Elkhorn, Nebraska on February 10, 2019. Gertrude grew up around the Decatur area. She lived with one of her brothers and his family (Ray and Tamsey Gatewood) and family friends (Carl and Anna Jensen), as both her parents had passed away before she was six. Gertrude went to school in Decatur. She married Dean Maryott in 1952. To this union were born three children. They lived by Springview, Nebraska; there they had a ranch and raised cattle and racehorses. Later Gertrude moved to Omaha, Nebraska and worked at the Life Care Center of Elkhorn, as head of House Keeping and Laundry, until she retired, at the age of 79, after 20 years of service. She was preceded in death by brothers, Ray Gatewood, Joe Gatewood, Dale Gatewood; sisters, Lillian Gatewood, Jackie "Sis" Erickson; twin sisters, Lucille Penny and Louella Brown. 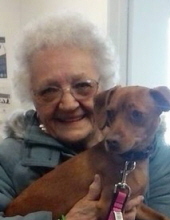 She is survived by her sons, Mike (Sandy) Maryott of Blair NE, Don (Cyncia) Maryott of Thurston NE; daughter, Kathy Maryott of Bennington, NE; 7 grandchildren, Jacque, Jennifer, Michael, Matt, Mark, Brad and Amanda; 13 great grandchildren; many nieces and nephews; her beloved dog, Lucy; many, many more dear friends. "Email Address" would like to share the life celebration of Gertrude "Trudy" Maryott. Click on the "link" to go to share a favorite memory or leave a condolence message for the family.